Waiting on Wednesday is a weekly event hosted by Jill at Breaking the Spine, spotlighting anticipated books! 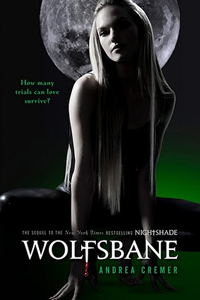 The end of Nightshade left me hanging, and I've been waiting for Wolfsbane for over a year. I'm so excited it's finally coming out this month! I love the mythology Cremer created, and Calla is a strong female character who I love. Of course there's the huge question -- who will Calla end up with, Ren or Shay? I love them both, but I'm on Team Ren. The two of them have so much undeniable chemistry, and I can't wait to see what happens between them! I didn't read Nightshade, but I know it was a huge favorite with people last year. I'm not sure I could handle another YA love triangle... but I hope you enjoy this one! Nice pick.